When it comes to snacks there is more to get excited about. Street vendors roast potatoes over coals, although unfortunately for us, always together with chunks of meat. At night, bands of mobile popcorn makers roam the streets providing a cheap and delicious snack, available salty or sweet. One can also find puffed Quinua and other Andean grains, available in small bags or pressed with honey into a type of granola bar. In the right hostel you can find a breakfast of yoghurt, sweet puffed grains and fresh papaya and bananas – delicious. When it comes to fruit, we didn’t try as many exotic varieties as I would have liked, but we did enjoy a juicy cherimoya in La Paz. 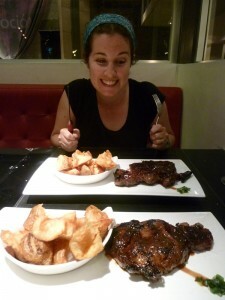 On one occasion our diet was supplemented by some wild protein. On a jungle trip in the Bolivian Amazon we were fishing for piranhas using hand reels when I was luckily enough to drag in a fish around a foot long. After checking for fins and scales, we decided it would be a welcome addition to what were some otherwise meager jungle rations. I killed the fish, a first for me, using the most readily available means, the oar of our canoe, and the fish was cooked up for lunch the following day. 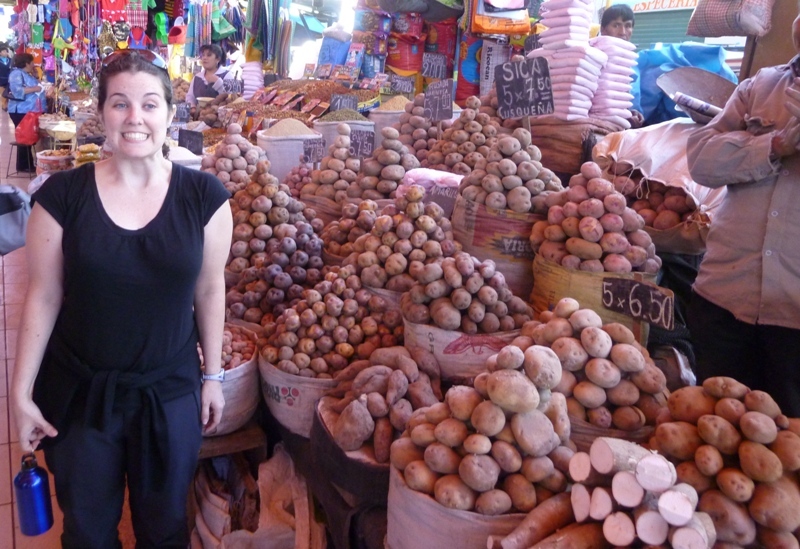 Civil unrest in Bolivia led us to fly early to northern Argentina, where we traded charming street markets for expensive, industrialized supermarkets where everything contained corn syrup, beef fat or both. The cattle industry is so enormous that the excess fat makes its way into bread, crackers and other baked goods. Additionally, in many places vegetarian food is nowhere to be found, indeed one should not be surprised to have one’s vegetarianism openly mocked. In this region we did a fair bit of self catering, utilizing our pot to make pasta and tomato sauce. 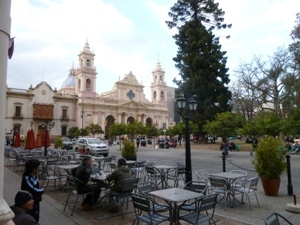 Upon reaching Buenos Aires, home to around 100,000 Jews and some of the world’s best kosher restaurants, we joined in the gluttony of the locals. An upmarket sushi chain has a kosher branch where we paid through the nose for a roll featuring mango, salmon and fried cheese, and another featuring citrus marinated salmon. 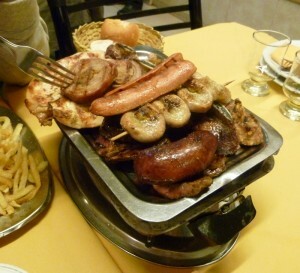 At the Al Galope restaurant we enjoyed a traditional Argentinian parilla, meat grilled over a wood fire. The steak, sausages, sweetbreads, meatballs and tripe were brought to our table on a mini grill with its own coals to keep it warm. The leftovers lasted two lunches but the meal itself was well, too meaty. It was tough to go straight into that much plain roasted unseasoned meat. Now I don’t think I have ever ingested a McDonald’s hamburger in my life, but if you are in Buenos Aires and for some reason there is a kosher McDonalds, why not? OK, I can think of many reasons why not, but we went for what would be a first time and last time experience. My frustration began when the worker took minute after gratification delaying minute to put together our already prepared meal. This is supposed to be fast food! Then I almost threw a fit trying desperately to open their tiny ketchup packets, which cannot be opened with greasy fingers. The bun was soggy and the meat bland – I’m assuming this is standard – not an experience I’ll miss. 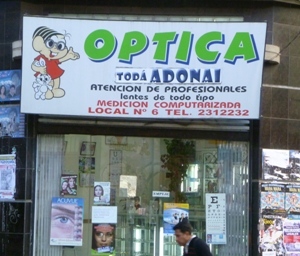 If I can give them credit for something is that their prices appeared to be the same as the non-kosher McDonald’s. And of course, the sight of a frum woman standing in the middle of a McDonald’s kitchen checking lettuce for bugs is priceless. The culinary highlight of our trip is a restaurant in Buenos Aires called Asian. After trying a few albeit delicious options we realized their pineapple, soy and ginger marinated steak ($22) is quite simply the best thing we can ever remember eating. Quality kosher wine is served by the bottle only, but for only $13 a bottle there is no fear in erring on the plentiful side. It was very expensive by Argentinean standards, but with quality and service that shamed anything we had experienced in the US, even at top dollar New York kosher restaurants. Argentineans eat ridiculously late, restaurants are usually packed at around 11pm, such that when we came at 8pm we had the whole place ourselves. A great way to finish off the first continent in our round-the-world trip. Bring on Australia. We got to the office at 8:45 for our pampas tour, after buying out the French bakery just in case we were in for another fat camp situation. At the office, we found two Australian girls from Byron Bay, but no one who worked there. The Australians told us the tour is now leaving at 9:30. Ugh, what is with this country? Why was everything always late? Oh well. This gave us time to go to the bank, and buy food for Shabbos that we would store at the hostel. I sat with the Australian girls and I was actually having a good time with them. We’ve met people on the road, but it’s hard to meet people who we click with. It happened a few times, but then those people were traveling on a different schedule than ours, and we never saw them again, so I was really excited about doing the pampas with funny interesting girls. At 9:30 they told us it was time to get in the jeeps for a 3 hour ride to reach the boats. They put us in a Toyota sedan. “This is not a jeep,” I said. The tour person laughed. Okaaay, I guess we’re getting in this car. The Australians also got in the car, but were then pulled out and replaced with a local woman carrying boxes of eggs and her 3 year old child. I did not like where this was headed. Was our tour group going to be us and this woman, child and eggs?? I told the tour people that we wanted to move cars to be in the real Jeep where they had put the Australian girls. They told me no, but I didn’t listen and went into the real Jeep anyway, when a woman begged me to get out. Fine. 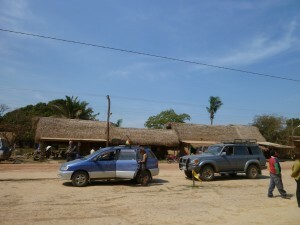 I will go in the small sedan, I told them, but we paid for an English tour guide and you need to make sure we are in an English speaking group. They told me of course, English, of course. I didn’t trust them at all, and was starting to believe I would have a Spanish speaking guide. I was also really disappointed to be pulled away from people I was actually able to talk to. I got in the sedan and cried, because I’m on emotional overload on this trip, as the woman shoved a French couple into the car. This was way too many people for a sedan. It was boiling out, and my mom rolled down her window as we drove off. The road was not paved and was all dirt and gravel, so as we drove we inhaled dirt. I couldn’t stop coughing, but my mom pointed out that it was too hot to have the windows up. True. A lose-lose. The French guy, who had said nothing to us yet, finally spoke to tell my mom to close the window because the child was cold. She grumbled about it, but did as she was told. Later we stopped the car, and the child peed out the door. This child was controlling all our moves. He was a tiny dictator, and I loved him because I thought it was hilarious that he called all the shots, and because he was super cute, and not physically accosting me like those hooligans in Ollantaytambo. 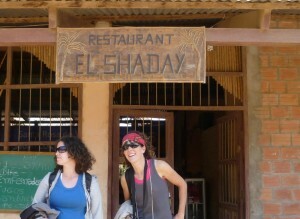 We got out to eat lunch at a restaurant called, no joke, “El Shaday.” Amazing. They served us vegetarian food, which was rice and some olives. Eww. Good thing we bought out the French bakery. 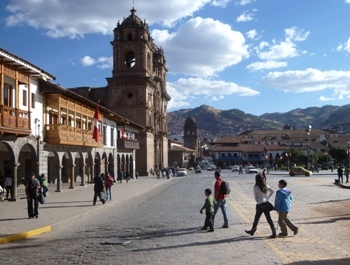 We started talking to the French couple to discover that they were in medical school together and had been doing medical internships in Arequipa, Peru. They had come to the jungle with a member of their Peruvian host family. They paid for his trip as a thank you gift for his hospitality. We did not see any Peruvian guy with them. Weird. They explained that for some reason the tour company had put their friend in a different group, and had separated them. Whaaaaat. Turns out the Peruvian guy was in the English speaking group with the Australian girls. I tried to tell one of the guides that we should switch with the Peruvian guy, but they would not have it. What a nightmare. The French people also explained that they were not a couple. The girl had an Australian boyfriend, and she wanted Bloom to tell her prices of flights from France to Australia. They also told us that their flight to the jungle town had been cancelled so they had to take a bus, which in the end had taken 30 hours and had no bathroom, so a woman had crapped in the aisle when the bus wouldn’t let her out. Our lives were looking extraordinary next to theirs. We were all in a group together, and we had not been on a 30 hour bus filled with human feces. Life was good, I guess. That killed it. Any chance of friendship I had with these girls was gone with the word Auschwitz. They stared at me, shocked. Oh no. I had forgotten that I was not dealing with Jews, and that anything to do with Auschwitz is not for polite company. But seriously, I think it’s cool that this guy did the tattoos at Auschwitz. Or maybe not cool, but absolutely fascinating. After a few moments of atrociously awkward silence, Bloom said, “well not a tattoo artist.” “What else do you call the person who did tattoos?” I said. The girls were still staring, and I felt like a moron. Why am I so stupid?? Why did I always have to bring up the Holocaust?? This is why I have no backpacker friends! I tried to change the subject, and eventually walked away mortified. Oh well, that one was my fault. Lesson learned. No mention of the Holocaust to people who are not Jewish, or maybe even to anyone other than Bloom and my mom. We eventually got to the boats where chaos ensued. They started putting people on the boats, but they told us that we did not belong on any of them, we would be on a different boat leaving later. My mom flipped out at this. “We are only here for two days, we want to leave now, and we want to be with an English speaking group!” she yelled, and I backed her up, yelling similar things. Everyone was staring at us. Some guy came up to us and said with an American accent “you can’t just go on your own boat when you want to go, you aren’t on a private tour.” Who was this moron? Why was he getting involved? “We just want to make sure we’re in an English speaking group, so if you want to get involved, you can use your Spanish to explain that to him.” He walked away, and I half expected to see him pull out a guitar and start playing John Mayer songs to the Australian girls. That’s the type of guy he was. The worst! A guy came up to us and told us he was our guide, and the rest of the group was on their way. When we saw that the rest of the group was a Spanish speaking couple and their two pre-teen kids, we were not thrilled. “This is a Spanish speaking group!” we yelled. “I SPEAK ENGLISH!” The guide yelled back. FINE. We got in the boat, only to realize that there were not enough seats for everyone in this dysfunctional group. The French guy was nice about it and sat on the floor of the boat, while everyone else sat on what looked like broken lawn-chairs from someone’s 1986 backyard. It was a weird motorized canoe with attached broken lawn-chairs. This was so weird. Whatever. The boat started and we saw many caiman. They were everywhere, so that was cool, and I tried to resist making Captain Hook references. 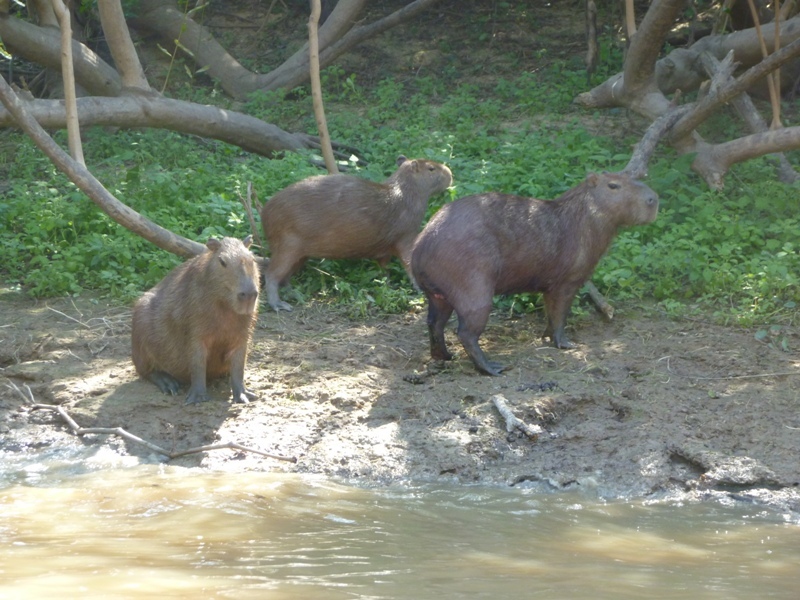 We also saw capybara (aka ginormous guinea pig, aka largest rodent in the world) and some monkeys. 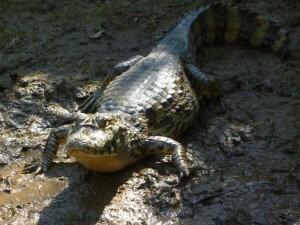 Large Caiman. I was afraid it would eat me. I think that fear was justified. A little bit into the boat ride, one of the Spanish speaking tweens passed me a baby turtle. What the hell was this? Why was she handing me a turtle? Our idiot guide had taken a baby turtle out of the water to show us. This cannot be right, or good for the turtle. 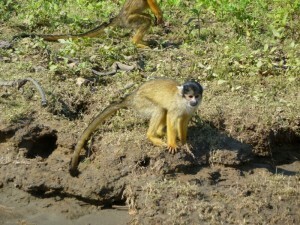 He then pulled over the boat to show us a bunch of monkeys in a tree. They were jumping happily, making monkey noises, when all of a sudden they started screeching and yelling and biting each other. It turns out our guide had thrown the monkeys food, and it made them go absolutely insane. Ugh. I was appalled. How could this guy be a guide? Every idiot knows you shouldn’t feed wild animals. We watched the monkeys’ civil war, and soon a bold, smart monkey stopped fighting the others and turned to his source of food: our boat. With a crazed look in his eyes, the monkey jumped onto the boat, practically landing in Bloom’s lap. AHHH! The guide jerked the boat with the motor, scaring the monkey, who jumped back onto land. Crap. This guy was a nutcase. “Any questions?” the guide asked. Those were the first two words he had spoken to us. No one said anything, so I said “Yeah. Don’t feed the animals!” I was not making a friend here. The family giggled. Watching the guide create a monkey war was traumatic and I didn’t feel like this guy would keep me safe from being eaten by a caiman, or even from a monkey. A few hours later, we arrived at the lodge, which was an absolute pit, and saw that the other, English speaking groups were already there eating popcorn. Hooray! Popcorn! I sat with the Australians, since I had decided I would just act like the Auschwitz comment hadn’t happened, and try again. Idiot John Mayer told me that this was their assigned group table for the trip. What was wrong with this guy? I looked around and saw an empty table with no popcorn on it. Was he trying to tell me I had to sit there? Fine, when Bloom and my mom walked in, I left John Mayer and we sat at the popcorn-less table trying to plan our next move. Eventually popcorn arrived at the table and all was right in the world, except that our guide had disappeared and had not told us where to put our stuff or where we were sleeping. A Bolivian guy sat down at our table wearing a hat that said “UCSB Grandpa” on it, and, assuming he worked there, my mom started asking him where we would sleep, and why was this place so crazy and disorganized, and why was there no communication?? UCSB Grandpa just stared at us blankly and shrugged. “Great. Just great.” my mom said. Later we realized that Grandpa was just a guy on the tour, who was of course also placed in the English speaking group. My mom and I felt terrible. We had yelled at the guy a few times. Oy. Maybe we are racists? I hope not. Does writing about it make it better, since I’m willing to admit my wrong? Maybe? We eventually tracked down our guide and he brought us to a tiny room crowded with beds, almost touching each other. The beds away from the door had all been taken. “The family!” I whispered angrily, fist in the air. They had taken all the “good” beds (honestly, they were all bad, but some were better than others). There weren’t even enough beds for us! My mom lost it. “I am 50 years old! You better give me a bed!” The guide looked at one of the beds and took someone’s bag off the bed, and told us we could use that bed as one of ours. We didn’t want to make anymore enemies, so we decided this was a bad move. After much fighting, beds were arranged for us, and we waited for our dinner of rice and olives. After dinner we went out for a night boat ride, which was amazing, since the stars were perfectly clear, and you could see all of the caimans eyes, which reflect the light to look like they’re glowing in the dark. After the ride we looked for the guide, who had disappeared, this time we did not find him, so we had no idea what time to wake up the next day or what the plan was. At 6 AM the next morning the guide banged on our door saying, “sunrise 10 minutes.” We watched the sunrise, which was cool and came back for breakfast, where they insisted we sit with our group. The family did not look pleased about this development. They brought out some toast, pancakes and fried donut things. There was enough given to our table for everyone to have one of everything, which was not nearly enough for Bloom’s morning carbo-load, and we had run out of our snacks. Of course this news made me go ballistic, and I forgot my pact with myself from the day before about not thinking/talking about the Holocaust. I went on quite a rant that I will not include here. “Ilana, stop it, you’re being crazy,” my mom told me. Both Bloom and my mom agreed that I was a lunatic, and ignored me. Bloom waited until the Germans got up, and then ate their leftovers, which they of course did not finish. After our embarrassing morning with the Germans we were told that we were no longer in a group with the Spanish speaking family and were moving to another group. Fine, whatever, this place was nuts, just put us on a boat. We got on a new boat and sat in the front seats. The new guide came out, followed by the German couple and the younger couple and told us to move to the back. No way, man. I was not moving to the back of the boat for some Germans who couldn’t give a starving Jew some bread. We were being yelled at everywhere we went. Move groups, move beds, move to the back of the boat… We had had it. We said we were not moving to the back. We apologized to the Germans for making a scene, and tried to explain how this whole trip had been chaos for us, but they just stared at us. Eventually we gave in and moved to the back, so the Germans could sit in front. We spent the day with them, and their Spanish speaking guide, not understanding what was going on. We got off the boat, and walked around in something they called a jungle, but what looked like a very unkempt Skokie backyard. I realized why it was so unkempt when the guide pulled out a machete and gratuitously hacked away at the small trees. What was wrong with these guides? We walked in the unkempt yard for about an hour, and then got back on the boat to look for dolphins, which was fine. On the dolphin searching ride, the Germans kept loudly insisting that the boat was being slowed down today because of the extra people (us), and that they had to speed things up because they had a flight to catch at 5:40 that evening. I couldn’t believe he was complaining about us weighing the boat down, repeatedly, in front of us! These Germans were actually out of control mean and crazy. FINALLY we were told it was time to go back to the town, and that we would take the boat to the jeep that would drive us back. The Germans had insisted that they needed their own boat that moved quicker, so we had been moved to another boat, yet again, this time with dreadlocked, smoking backpackers. My mom flew to La Paz the next day to be safe, since her flight was on Monday morning, and these flights are notoriously late, sometimes by many days. She came to our hostel room right before her flight to tell us that she had seen the Germans at the “airport” earlier this morning and had called them out. “Hi! I am so surprised to see you here!” she had said to them. She told us that they just muttered something and walked away. What did they have to gain by lying about a flight? What was wrong with these people? We never did quite figure it out. On Sunday we had the luxury of flying from Cuzco to La Paz, Bolivia, and then from La Paz to the jungle town of Rurrenabaque. 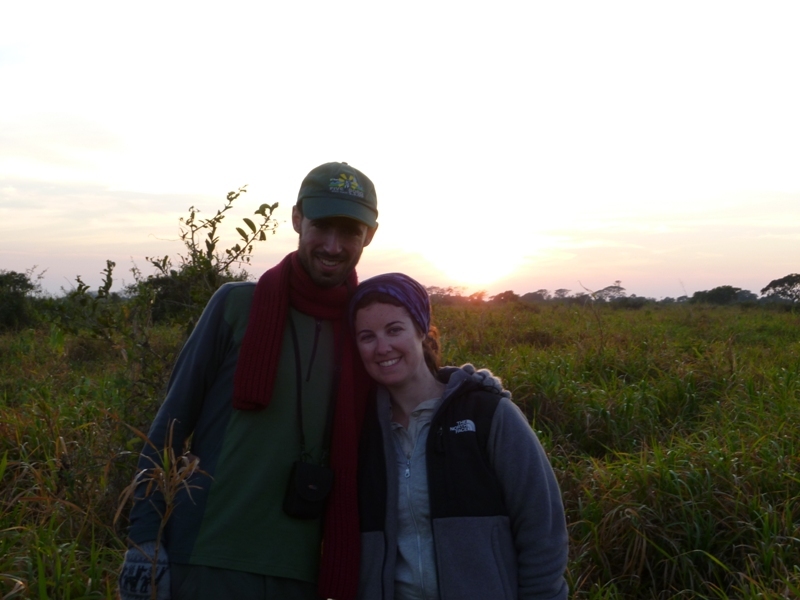 Since we were with my mom, we were moving as quickly as possible, so she could see as much in her two weeks with us, and we wanted to get in as much jungle exploration before Shabbos, so it worked out well to fly. The plane to Rurrenabaque fit 18 people and had propellers. It was a 35 minute flight, and we could see the pilots flying the plane, which was weird, since we repeatedly watched them take sips of Fanta as they flew the plane, which made my mother nervous. We landed into a very rainy day, and needed to book a hostel and a jungle trip for the next day. We spent the next few hours looking at different hostels, which I would then reject, and trying to avoid puddles and speeding motorcyclists. I felt like goldilocks. The first hostel stunk. We had stayed in a stinky hostel before, and it is terrible. It seems that in some hostel bathrooms the toilet doesn’t really flush or something, because the bathroom and the entire room smell like an elephant’s cage at the zoo. I don’t know about you, but I’m really not into sleeping in an elephant’s cage. The next hostel looked just as crap as the first, but it was more expensive. I figured that I shouldn’t pay more for another crappy room, maybe I should just go back and sleep in the elephant cage and stop being such a wench about things. The next hostel was fully booked. The next hostel seemed alright, and by then I was exhausted and gave in to whatever sleeping arrangements I could find. Now we had to find a tour. We decided to go with madidi-travel. They have an eco-lodge in the jungle, and they said they cared about conservation and the animals, and supporting local people. It was expensive, but we decided that we wanted to go with a responsible/ethical group, and the guy trying to sell us the trip was Australian, so that definitely helped, and he spoke exactly like Bloom’s Australian friend Feiber, which amused us. Being sold tours by Spanish speakers who couldn’t answer our questions was a tough sell. 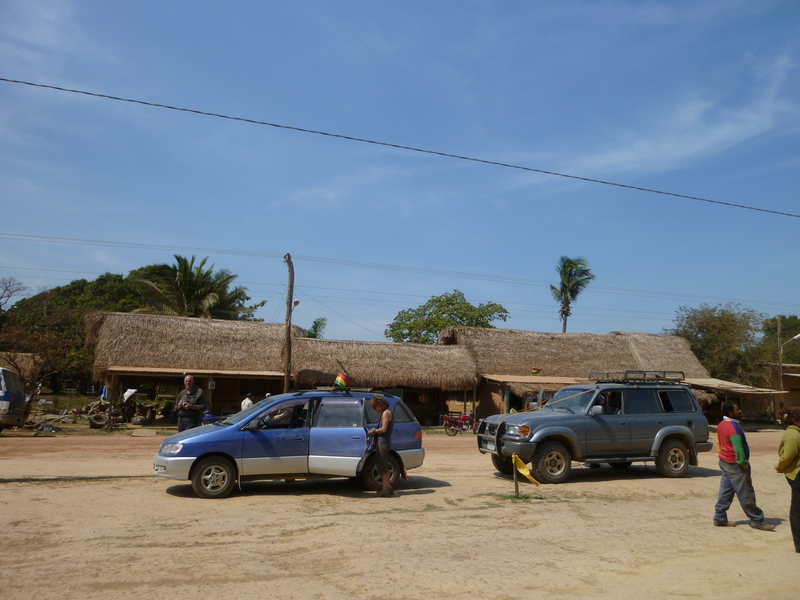 So fine, we were going with Fake-Feiber and his madidi-travel to the jungle for a 3 day tour leaving the next day. We asked Fake-Feiber to advise us on a pampas tour for two days that we could do after the jungle and he told us to go with Dolphin Tours. We were too tired at that point to really do research on the matter, so we went to Dolphin and booked a 2 day pampas tour (more like a safari tour than a jungle excursion), and we were set for the week. We also booked a hotel for Wed. night, Friday night and Saturday night. Good. We got to the madidi office at 10:30 AM, the time they had told us to meet there, and were told that no one else was in our group, so we would have a private tour. Great! When do we leave? An hour and a half and a new guide later, we were told that we were finally leaving, and that we should get on the boat for a 3 hour ride to the jungle lodge. FINALLY. We went out back and got on what appeared to be a large motorized canoe. At around 1, they gave us packed lunches that consisted of a mini pizza (delicious) and a brownie (pesadic?). This was turning out alright. The boat ride was pleasant, and we had snacks, the day was looking up. We arrived in the jungle and walked for a half hour to our cabins. The cabins were awesome. Much nicer than any of our hostels by a long shot. The cabins had screens over all the walls so you felt like you were sitting in the jungle, and the bed had a mosquito net, which I loved. I am seriously considering putting a mosquito net over my bed in NY. It’s great. It’s romantic, like a canopy bed, and you know you’re safe from bugs! Amazing! We met our guide, Hilda, back at the “casa grande” aka the main lodge where you eat and can sit in hammocks, and went out on one of the lakes in a canoe. We saw big birds, which I liked and caimans, which freaked me out, but were cool. We returned to the casa grande for dinner at 7:30 only to find no dinner. By this point I was starving and longing for more of that pizza or even the pesadic brownie. They did offer us some fried plantain chips, which I tried not to devour too quickly in front of the other guests who were waiting for dinner with us. At around 9 they told us dinner was ready, and we sat down, starving at this point and ready for a big meal. A woman came around and put plates in front of people. My mom and I looked at her plate. It literally had one piece of cauliflower, 2 small green beans, 2 small carrots and small serving of rice. “Is this a joke?” my mom asked me. I looked around. No, this wasn’t a joke. This was our dinner after a day in the jungle and a small lunch 8 hours earlier. “This is fat camp.” I announced, and even my mom agreed that yes, this was indeed a jungle fat camp. We were sitting across from a young German couple, who were lovely people, but I was still convinced the guy’s name was Klaus, since he spoke like a Nazi. You may ask, but doesn’t every German speak like a Nazi to you? Well, kind of. But, not really. Although young Germans are of course not Nazis, they are the ones who sound like Nazis because in movies Nazis are of course young men and not old men who are more likely the real live Nazis. Anyway, it turns our Klaus was allergic to fish, so I immediately agreed to trade my one cauliflower for his tiny fish. The Australian girl who worked at the lodge (Fake Feiber’s girlfriend), was not too keen on my idea of making a trade. “You’re a vegetarian,” she told me. “Yeah, but it’s complicated, and I want his fish and he wants this meal…” “But he didn’t sign up for it,” Crazypants insisted. Ugh. We ignored Crazypants and switched our meals. I loved Klaus. I started eating the fish and realized maybe I didn’t love Klaus. This fish sucked and was all bones. That’s probably part of the fat camp mentality. Make the fat campers work for their fish by putting bones in every bite. I understood their game. We got to talking to Klaus and partner. They told us they had been on their jungle trip and were leaving the next day. They were not having a good time. They told us they had been lied to about group size and they were never fed, and their guide didn’t speak English. Uh oh. This was not a good sign. “They are not organized. We need things to be organized,” Klaus said. DUH. You’re German. We KNOW you’re into being organized! Your records of the Holocaust fill museums, you organized lunatics! I kept that in my head, obviously. Bloom realized that Fraulein wasn’t eating her rice, so asked her for it. She was a normal human being, so she let him eat the rice. Poor Bloom. If anyone does not need fat camp, it’s him. If you know Bloom, you know that to maintain his figure, and not become a skeleton, he needs to eat kilos of rice and/or bread at every meal. He will disagree with me on this, but I watch him eat, and it’s true. He needs to carbo-load as if he’s running a marathon every day, and if he doesn’t his pants fall off. I’m pretty sure that Bloom ate 8-9 bananas and 6 granola bars the next day to supplement his fat camp diet. The Germans told us that they had come from a pampas tour with Dolphin, and it had been amazing. “Much better than this. More organized. More animals,” Klaus said. Good. We were all relieved. If these organized Germans liked the pampas so would we. That night we went on a night hike in the jungle, which scared the hell out of me, because it’s pitch black and all you hear are the animals, probably smelling you and thinking of eating you. We heard crazy howler monkeys that sounded like the wind in a horror movie. Terrifying. The next day we did a jungle walk for many hours. It was cool and I enjoyed looking at the trees and bugs for the first hour, but then I got bored, probably because I have an attention disorder. When I told my mom I was bored and that she should have had me tested for an attention disorder as a child, she told me I was ridiculous. “You never took my attention problems seriously.” “That’s because you don’t have an attention problem.” That settled that. Massive Tree. Watch out for the termites, tree! Whatever, I was bored and this was supposed to be a quiet hike so we could hear the animals, so, in keeping with my heritage I decided to go over our budget in my head. I started thinking of how many Bolivianos we had already spent, plus the cost of hostels…that equals…Uh oh. That was when I realized that I don’t know my multiples of 7, and $1=7 Bolivianos. Good. This would keep me busy. I spent the next 30 minutes trying to re-memorize the multiples of 7. When I finished, I told my mom and Bloom my accomplishment of re-memorizing the multiples of 7. “This is supposed to be a quiet walk,” Bloom whispered. “Wait, you really didn’t remember the multiples of 7?” My mom asked. “I told you that you should’ve tested me! It’s probably because of my attention issues!” My mom rolled her eyes. “Look at the trees!” She said. “Hevanti et ha’ra’ayon” I said, which is an Amit line meaning—I get the idea, I don’t need to see anymore. Leaf cutter ants. They carry those leaves all day and night. Luckily, as I was starting to figure out if I remembered the multiples of 8, our guide stopped in the middle of the path and whispered “capuuchino monkeys.” I loved this guide, primarily because he smiled and whispered a lot, which was adorable. He would often stop and then point at something and whisper it’s name very seriously. He motioned for us to crouch down and we did. He pointed at a tree and we heard all sort of rustling noises and then saw little monkeys all over the tree. And then, one by one the monkeys jumped from one tree into a smaller bush. It was awesome. There were about 70 monkeys. They kept coming and jumping, and each time it looked like they would fall to the ground, but they usually made it to the next branch. I was no longer thinking of multiplication. We then went back on another canoe into another lake, this time to go piranha fishing. Hevanti et ha’ra’ayon quickly with this activity, but the boat was nice and relaxing, so I was ok with it. My mom was really getting competitive about catching a fish, but she caught none. Bloom and I both seemed disinterested, and I’m pretty sure Bloom was sleeping when all of a sudden he had something on his line. He pulled at it and instead of a tiny piranha it was a massive fish! It was a foot long or so. He somehow managed to get it in the boat. “Jungel Salmon.” The guide proclaimed. It had fins and scales and was some form of salmon, so we would be able to eat it. Hooray! This was close to my dream of killing my own food, except Bloom was the one killing it. This also meant we would have something to supplement our fat camp diet! This day was turning out alright! The fish was in the boat now, thrashing around, looking like it would jump back at any moment. “You must kill it,” the guide told Bloom, and handed him an oar. Now, things were getting crazy. What was Bloom supposed to do with the oar? The guide motioned to Bloom that he had to smash it over the head to kill it completely. Oh my god. We then watched Bloom repeatedly smash the fish over the head with the wooden oar. This was awesome. I felt bad for the fish, but if I eat fish I should be able to witness it being pounded to death with an oar. I wish I would’ve caught it on video. 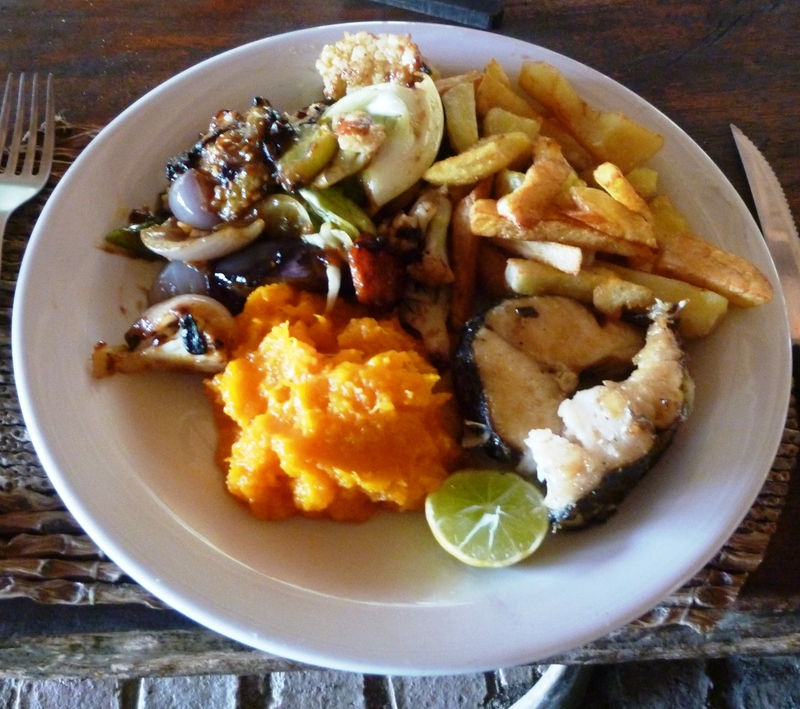 Instead of supplementing our fat camp diet with the fish, the fat camp used the fish and served it to us for lunch the next day. Cheap move, fat camp. We have to fish for our own food? We of course had to fight with Crazypants to even get her to serve us the fish. “Why would fake-Feiber date this crazypants? ?” I kept asking Bloom. Fake-Feiber had been so nice to us, and Crazypants was so, well….crazypants! She hated us, and I’m not quite sure why. Maybe she heard me call the lodge an expensive jungle fat camp where nothing is on time. That might be it. Before we left, we went on one more long jungle walk. As we were walking the guide stopped and whispered “jungel peeg.” He had been talking about this jungle pig for days, and I wasn’t too excited about it. What’s exciting about seeing a pig? As I was thinking this, we heard very loud thrashing and snorting. The guide took my head in his hands and put it at the right angle so I could see a group of very very large and scary warthogs grunting and gnawing at things. the guide said, “I will make noise of predator of peeg, scare away.” The guide then grunted a few times. I was going to be saved by a snorting Bolivian man? I was terrified the rest of the morning, and was not happy when the guide and my mom hid behind a tree and snorted at me to scare me. It worked. I was happy to leave the jungle, even though overall it was a good time. When we returned to the office we told fake-Feiber that we were frustrated by the fat camp nature of the place and that everything was always hours late. Every day. He was very understanding and nice about it. I wanted to ask him about Crazypants, but decided against it. My mom was going to complain to him about Crazypants, but we all decided we would just leave it alone, and move on to our next trip.